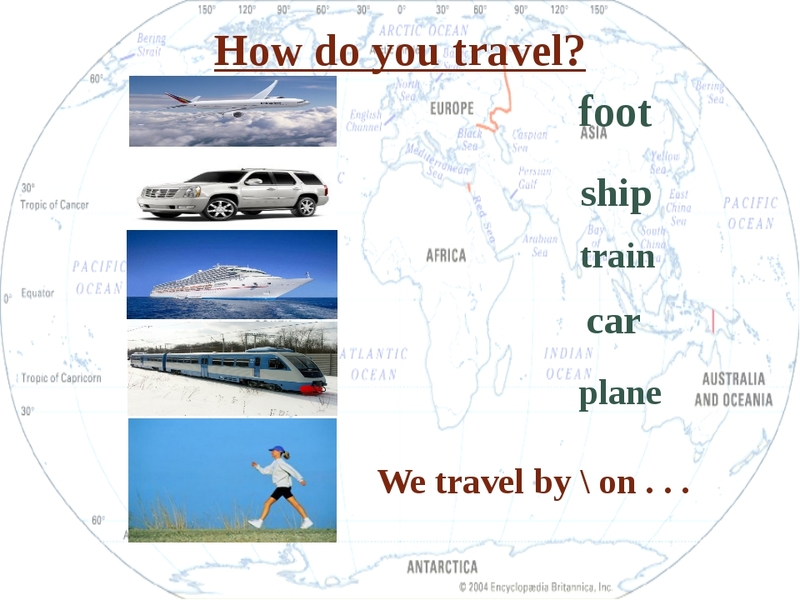 I like to travel By plane or on foot To see new places We go by car That’s really good. And we go by train Over the mountains, We go by boat Over the plains, And we go by plane. Over the rivers We go by land Here come trains. And sea and air We go, go, go From here to there. Carrying passengers, Carrying mail, Over the country Here come trains. 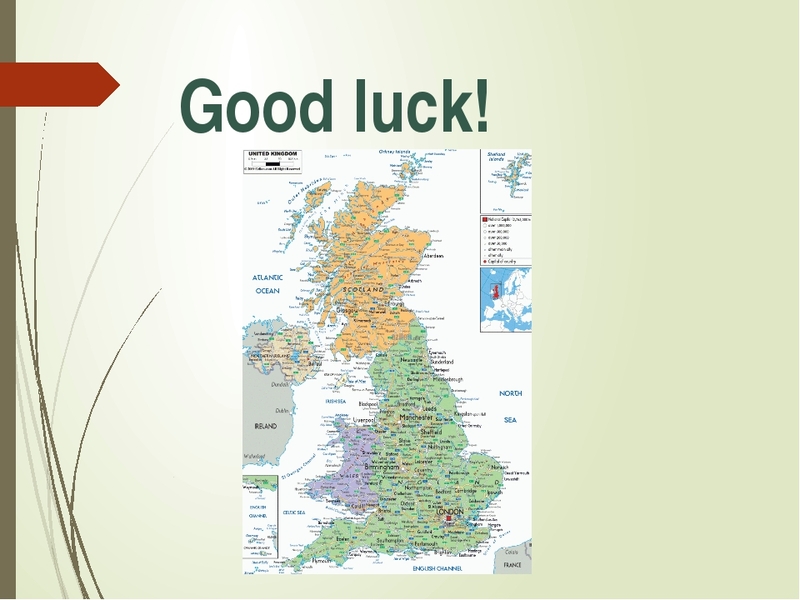 Which English-speaking countries will be visited by the winners of the Teenagers’ Competition? 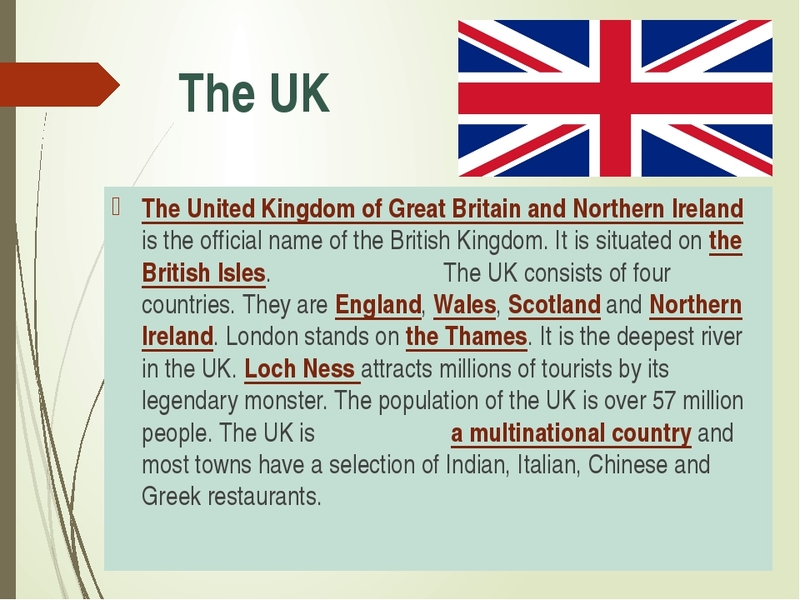 The UK The United Kingdom of Great Britain and Northern Ireland is the official name of the British Kingdom. 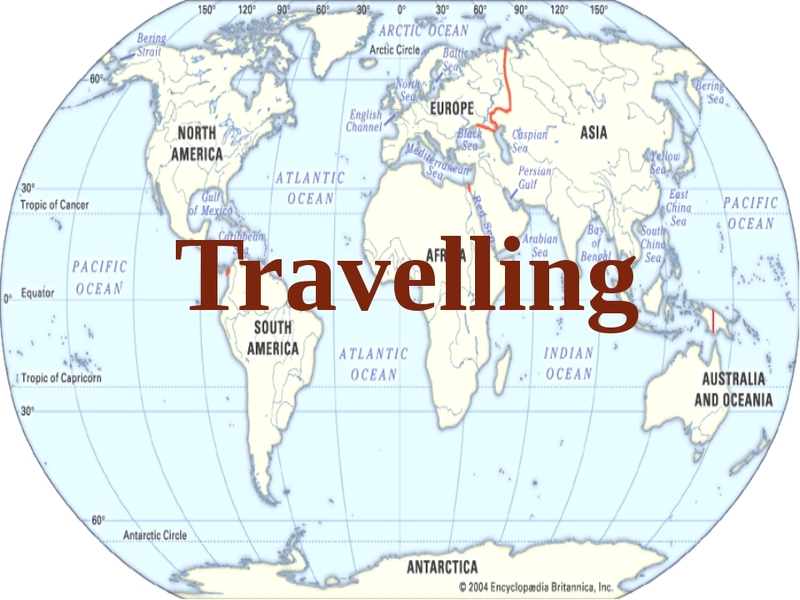 It is situated on the British Isles. The UK consists of four countries. They are England, Wales, Scotland and Northern Ireland. London stands on the Thames. It is the deepest river in the UK. Loch Ness attracts millions of tourists by its legendary monster. The population of the UK is over 57 million people. The UK is a multinational country and most towns have a selection of Indian, Italian, Chinese and Greek restaurants. The capital of the UK is London. 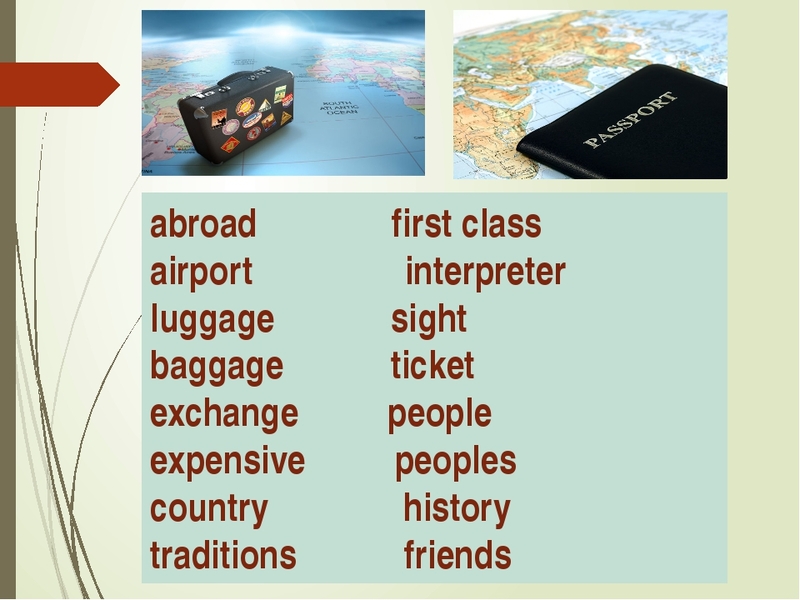 The official language is English. The flag of the UK is Known as the Union Jack. The UK is famous for Big Ben, Trafalgar Square, the Houses of Parliament and Westminster Abbey. 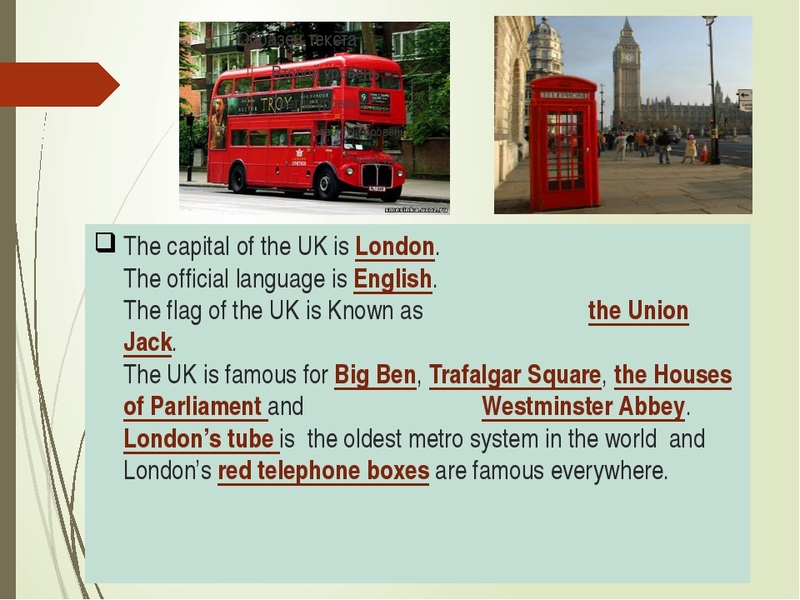 London’s tube is the oldest metro system in the world and London’s red telephone boxes are famous everywhere. The USA The United States of America is the fourth largest country in the world (after Russia, Canada and China). It stretches from the Pacific to the Atlantic Ocean. It also includes Alaska in the north and Hawaii in the Pacific Ocean. 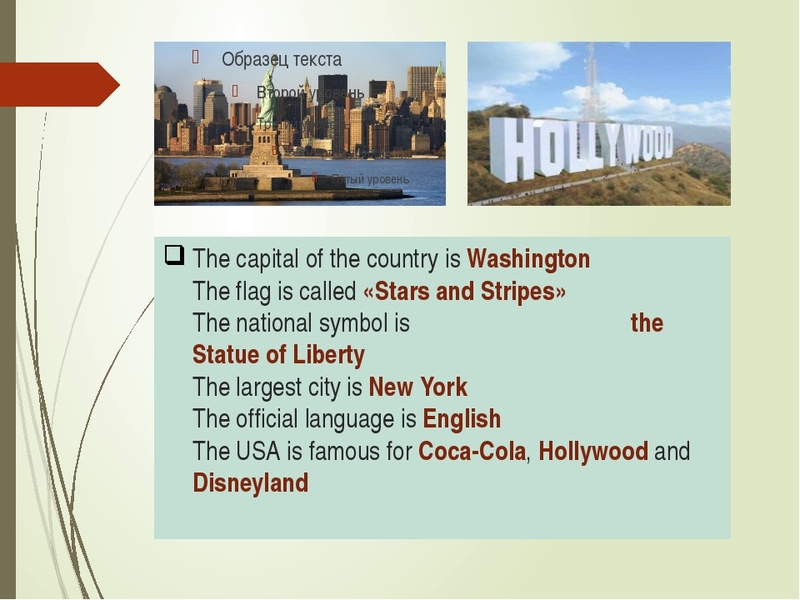 The USA is made up of 50 states and the District of Columbia. The population of the country is about 250 million. The USA is a highly developed industrial country. There are no national holidays in the United States. 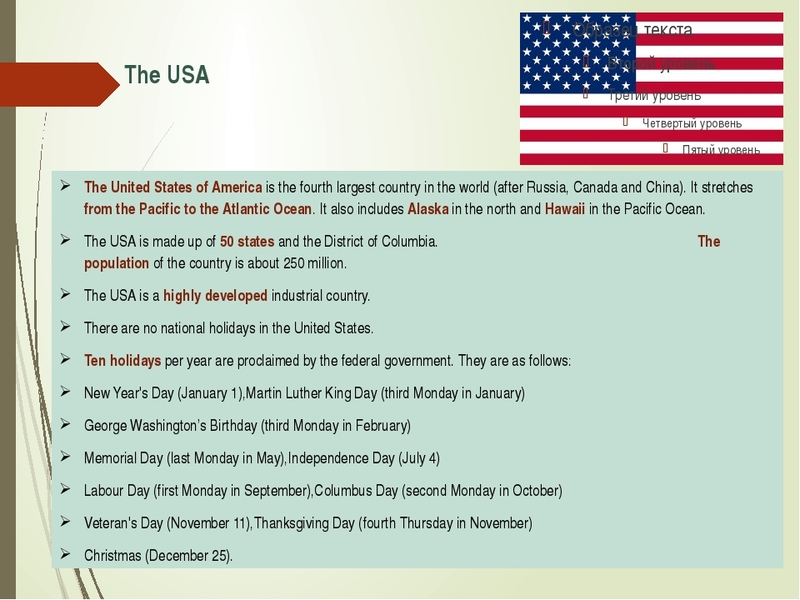 Ten holidays per year are proclaimed by the federal government. They are as follows: New Year's Day (January 1),Martin Luther King Day (third Monday in January) George Washington’s Birthday (third Monday in February) Memorial Day (last Monday in May),Independence Day (July 4) Labour Day (first Monday in September),Columbus Day (second Monday in October) Veteran's Day (November 11),Thanksgiving Day (fourth Thursday in November) Christmas (December 25). Canada Canada is the second largest country in the world. It is situated in North America. 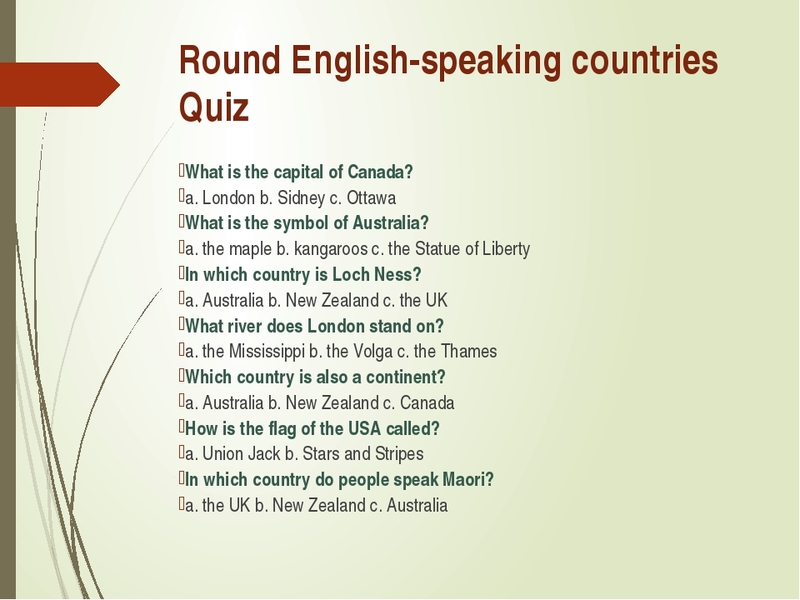 Canada is a federation of 10 provinces and 2 territories. There are two official languages in Canada. They are French and English. The capital of the country is Ottawa. The largest cities are Toronto and Montreal. 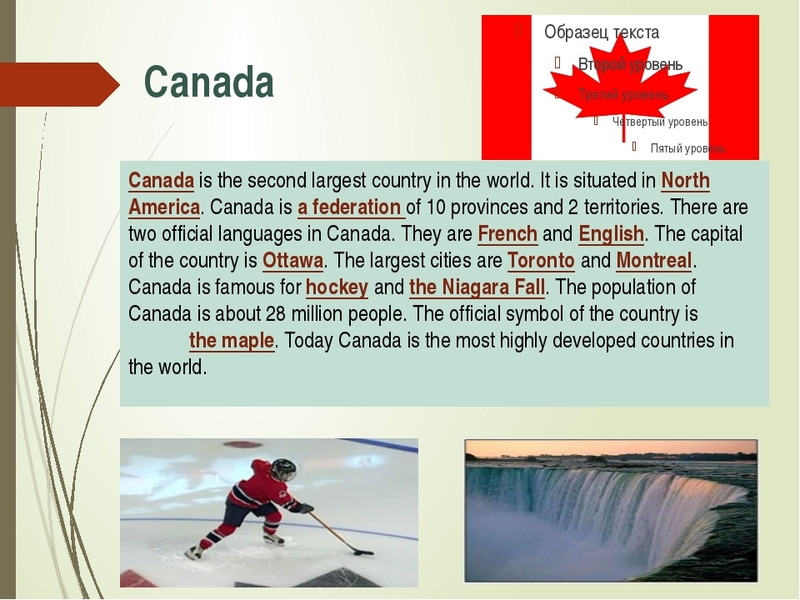 Canada is famous for hockey and the Niagara Fall. The population of Canada is about 28 million people. The official symbol of the country is the maple. Today Canada is the most highly developed countries in the world. 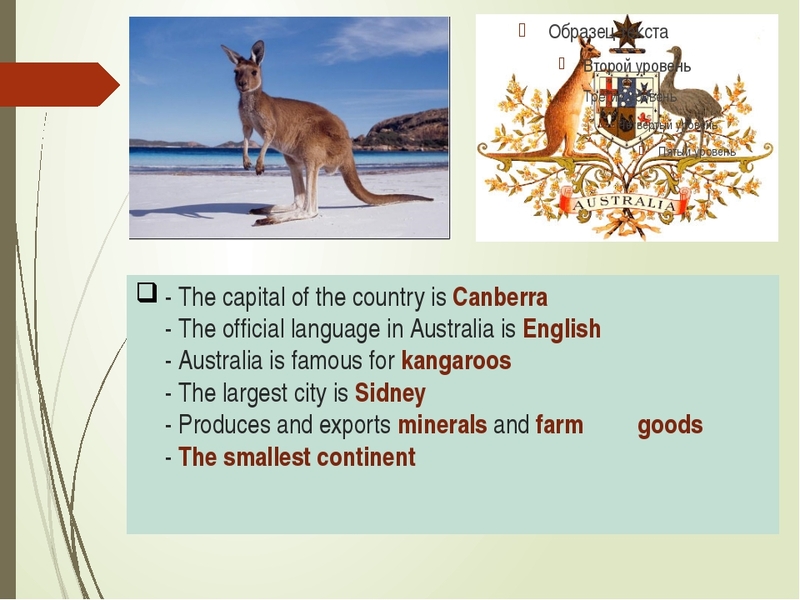 Australia or colloquially , officially the Commonwealth of Australia, is a country comprising the mainland of the Australian continent, the island of Tasmania, and numerous smaller islands. 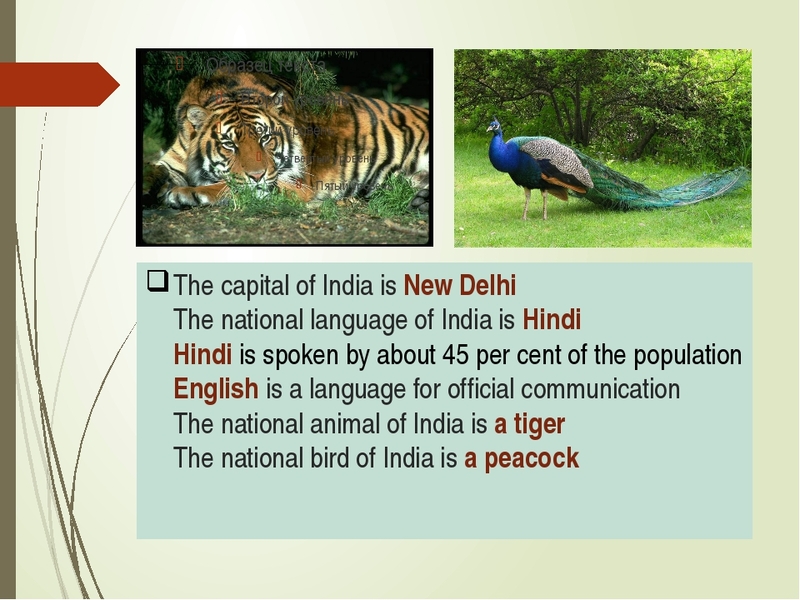 It is the world's sixth-largest country by total area. Australia is a developed country and one of the wealthiest in the world . 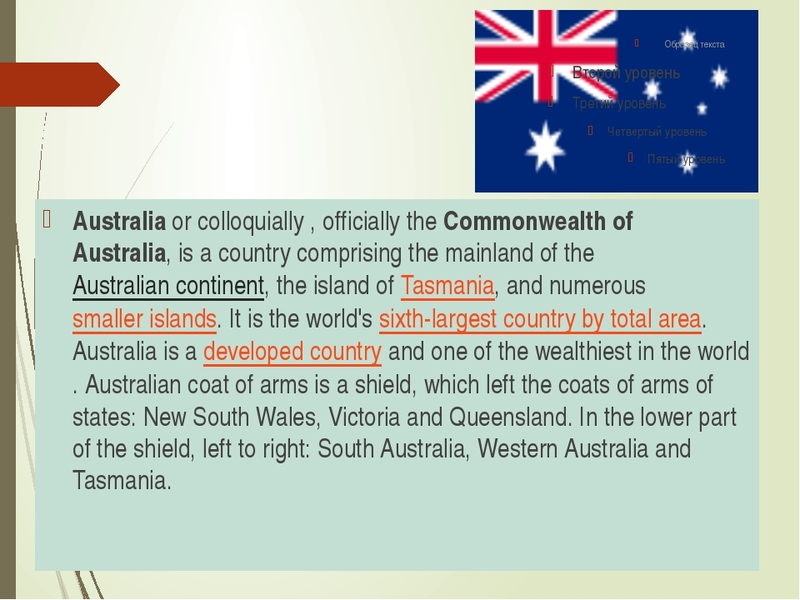 Australian coat of arms is a shield, which left the coats of arms of states: New South Wales, Victoria and Queensland. In the lower part of the shield, left to right: South Australia, Western Australia and Tasmania. New Zealand New Zealand is an island in the south-west Pacific Ocean. New Zealand belongs to a large island group called Polynesia. The main islands are the North Island and the South Island. Most aborigines speak English and their own language, Maori. 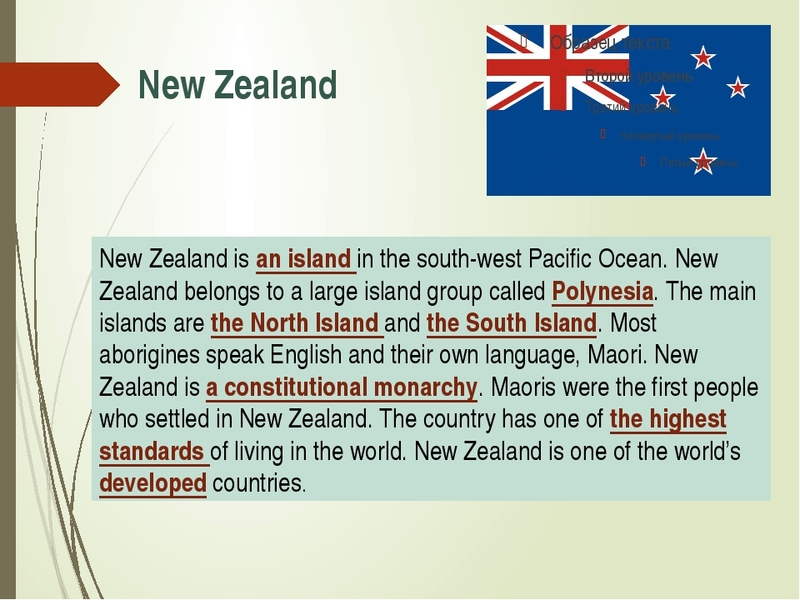 New Zealand is a constitutional monarchy. Maoris were the first people who settled in New Zealand. The country has one of the highest standards of living in the world. New Zealand is one of the world’s developed countries. The capital of the country is Wellington. The largest city is Auckland. 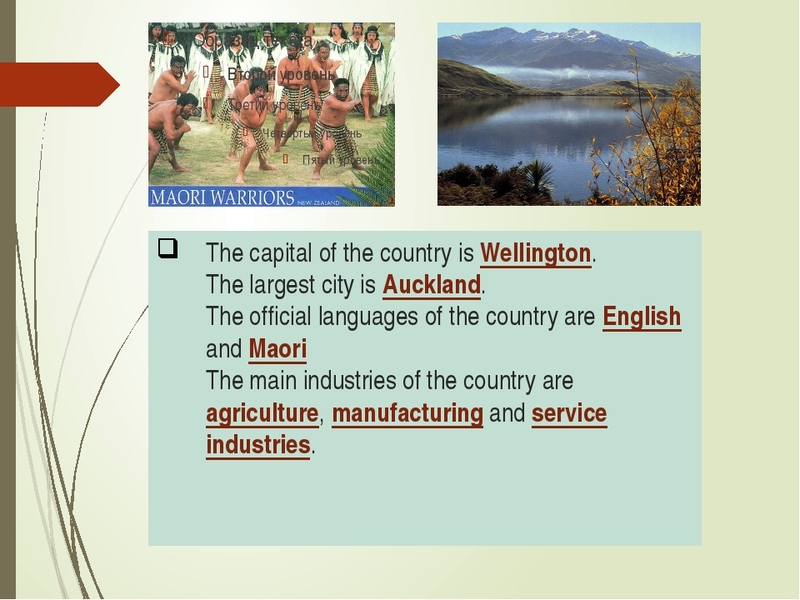 The official languages of the country are English and Maori The main industries of the country are agriculture, manufacturing and service industries. 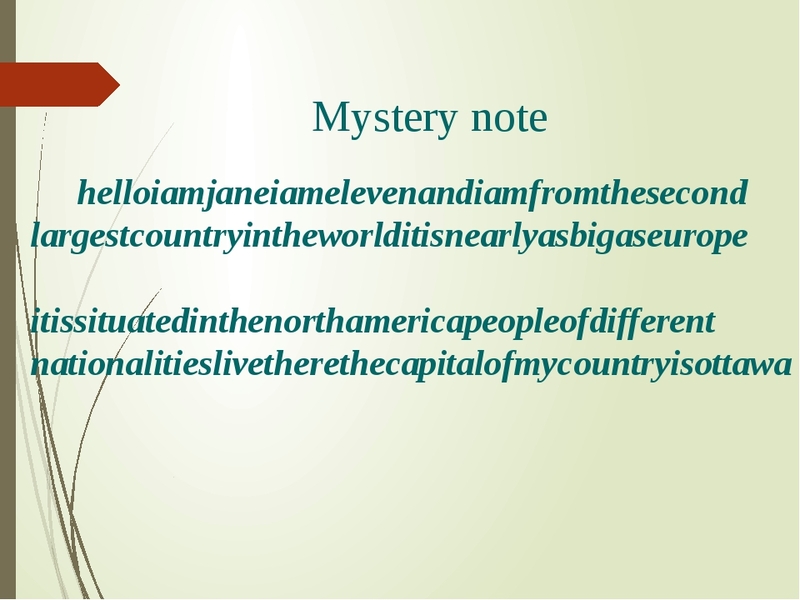 Mystery note Hello, I'm Jane. I' m eleven and I am from the second largest country in the world. It is nearly as big as Europe. It is situated in the North America. 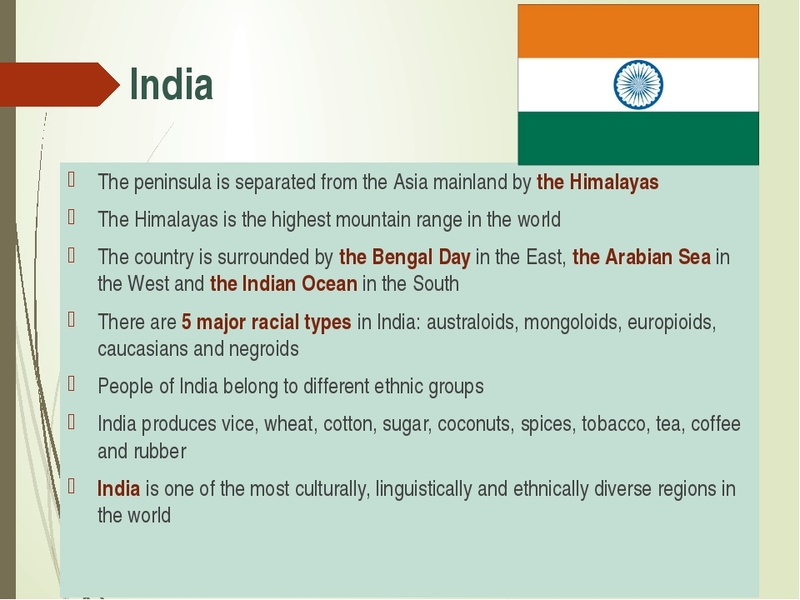 People of different nationalities live there. The capital of my country is Ottawa. Презентация предназначена для проведения урока-путешествия по англоязычным странам в 7 классе. Разработана в качестве обобщающего материала по теме "Путешествие" (УМК Биболетовой М.З., Денисенко О.А., Трубаневой Н.Н. «EnjoyEnglish 7»). Цель-развитие коммуникативных умений и навыков учащихся, расширение кругозора, активизация страноведческой лексики в устной речи. Презентация содержит лингвострановедческий материал, речевую разминку и задания, развивающие логическое мышление. Яркий красочный материал не только интересен детям, но и помогает учителю в создании мотивационной сферы к изучению английского языка.